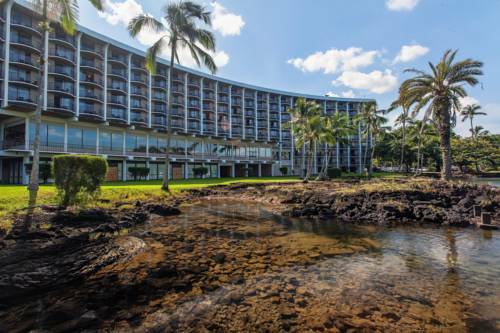 Hilo s best full-service hotel offering outstanding views Of the ocean framed by the back-drop of mauna kea. A perfect headquarters for exploring the hawaii volcanoes national park. Located on Hilo Bay and approximately two miles from Hilo Airport Hilo Hawaiian Hotel is the perfect headquarters for exploring the Hawaii Volcanoes National Park. Enjoy incredible views of Mauna Kea Hilo Town and beautiful and historic Coconut Island. A 1 night room deposit will be charged at time of booking. Credit card deposits must be in the guest s name or in the name of a member in the traveling party. NEWLY RENOVATED Cuisine Type - A LA CARTE BUFFET BREAKFAST DAILY DINNER MON.-THURS BUFFE DINNER FRI. -SUN. Exhibits are in a sturdy old bank building in the Hawaiian city that's suffered the most damage from tsunamis -- which have killed more people in Hawaii than all other natural disasters combined. ~1 miles from Hilo, Big Island. Self-guided tour along windows overlooking the nut line -- see the sorting, chocolate enrobing, packaging, and other exciting candy manufacturing processes. Gift shop. ~6 miles from Hilo, Big Island. Small museum preserves photos and artifacts from the early 20th century operation of a train along the Hamakua coast to Hilo. ~21 miles from Hilo, Big Island. Volcano tourists enjoy a natural sauna by standing next to escaping steam from cracks in the rocks. ~24 miles from Hilo, Big Island.